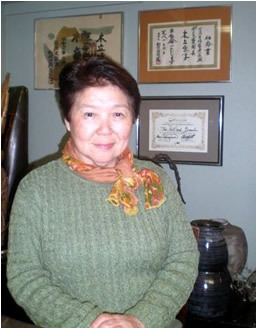 Director Emeritus Keiko Kodachi holds the highest teaching rank of Riji in the Sogetsu school of ikebana and has taught in Portland since 1961. She teaches classes several times a week and conducts workshops for Sogetsu as well as Ikebana International events. The observations that follow are based on her Tuesday evening class on February 7, 2012. Kodachi-sensei was born in Japan and grew up near Asakusa, close to Ueno Station which is considered the northern gateway to Tokyo. Travelers have easy access by train to the northeast prefectures as well as to central Tokyo and Narita airport via subway. With proximity to Ueno Park and the Tokyo National Museum, she remembers her house being a welcome stop for family and friends traveling north and south. Just as her childhood home offered travelers the warmth of home, Kodachi-sensei's ikebana class offers her students a sense of community, a place to connect, speak or learn Japanese, and to experience elements of Japanese culture. 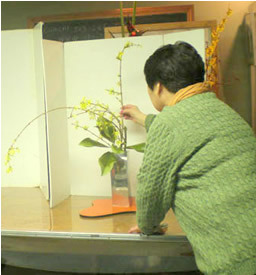 Kodachi-sensei's ikebana studio is information-central for Sogetsu students. After greeting students that evening-konban wa!-- she asked them to sign a Get Well card for a branch member recovering from hip surgery. Then she offered everyone some roasted soybeans from a one-cup masu (square wood container) to celebrate Setsubun (bean-throwing ceremony) celebrated yearly on February 3 as part of the Spring Festival in Japan. Participants in the special ritual, called mamemaki, throw a handful of soybeans to cleanse away all of the evil from the previous year and drive away evil spirits in the year to come. However, instead of throwing the soybeans, Kodachi-sensei's students ate the tasty and nutritious snacks! During the lesson, Kodachi-sensei walked around to students and offered help and suggestions. For one student she held a branch and directed the student to a larger pair of pruning shears. When another student completed her first arrangement, Kodachi-sensei suggested that she use a kadai. Once the arrangement was placed on the shiny black 16" by 24" plastic rectangle, the beauty of the creation emerged. The student noted, "All it needed was a frame!" Kodachi-sensei smiled and said she thinks she got the plastic piece from a hardware store for $5. A mix of Japanese and English conversation ebbed and flowed as students worked independently. When she thought one student was visiting too long after making one arrangement, she gently suggested in Japanese, "Why don't you make another one?" She provided reminders and encouragement as she moved from student to student: "Nandina is mass." "Once we learn, we cannot go back to classic style." "Good materials easy. Hard materials good challenge." When she believed that an arrangement was complete, she would say "Sono hoo ga ii desu! " Nothing more, time to stop fiddling! As Kodachi-sensei performed the final critique of arrangements, sometimes snipping leaves to open up "views" to rear branches or snipping small stems from branches to emphasize the straight or circular movement of lines, she pronounced to each student what they had been waiting to hear: "Hai, kekko desu yo! " 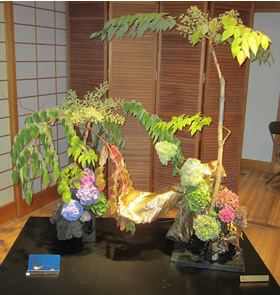 Kodachi-sensei welcomes all students, both those new to Sogetsu ikebana as well as those who have studied for 30 years. She believes that teaching keeps her mind and English language skills active and she gains inspiration from watching everyone since "each time is different." Perhaps you may never get to Ueno Station in Tokyo, but keep in mind that you are welcome to travel to Portland Sogetsu Central at Kodachi-sensei's studio.